Floyd Mayweather Jr. made his professional debut 21 years ago and wasn’t a novice even then, he was a schooled and proven amateur with Olympic silver for credentials. He started as a super featherweight and grew up to (super) welterweight. This time the fight is contracted at light middleweight or 154 lbs., a comfortable limit considering the two years of inactivity/retirement for the boxing superstar. Conor McGregor has some amateur boxing background but no official boxing fights to his name. He is an MMA phenomenon stretching his skills from 145 lbs to 170 lbs and has provided exciting fights garnished with foul language to keep the masses exhilarated. His strength as a martial artist is striking, especially hand strikes and he excels in his stand-up game against all comers in MMA. The rivalry between the boxing industry and the MMA platforms has been heating up on several levels and now the two worlds have reached an unlikely alliance. The emerging box-office records are enough to obliterate most irreconcilable issues of the parties. Technical and administrative hurdles have been hastily cleared and the event came together faster than fans could dream. Boxing fans are used to waiting for years for a good match-up and MMA’s instant gratification approach has given a good example to boxing promoters in a venture of this magnitude. This is not just a boxing fight, if at all, it’s a transaction, a joint venture honestly billed as “The Money Fight”, a name it will probably live up to and the fans understand and accept all that. The boxing mega star comes back from retirement for a huge incentive and the MMA star has fought everybody who makes sense in his platform. Both will be cashing in on their collective career efforts that have set the stage for this show down. 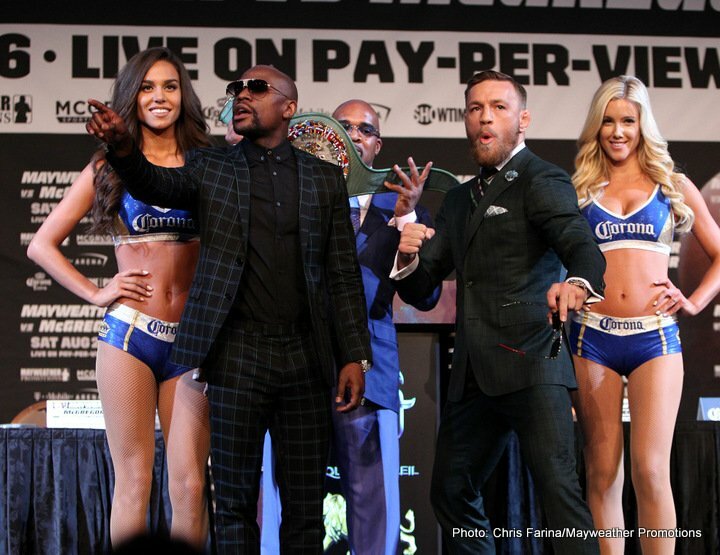 The technical details seem to be all in Mayweather’s favor. This will be a twelve round non-title boxing match and Floyd has agreed to smaller 8-ounce gloves. McCregor is used to 4-ounce MMA gloves, so the “small” gloves will be twice the size of his habitual “tools”. UFC rounds last 5 minutes and kicking and grappling is more exerting than boxing. Still 12 rounds can be a very long time for Conor with his stamina issues in a strange ring with such a skill differential between the stars. Mayweather’s boxing mastery and savvy are beyond doubt while McGregor is literally a novice in the ring. His boxing training as a teenager and his sparring session with pro boxers matter very little in a real prize fight. McGregor does not have a proper boxing stance as it would be useless and dangerous in his platform. Boxing stance provides little defense against kicks and even less against take downs. Boxing stance in MMA could be used only as a faint of sorts. McGregor could not possibly change his habits on such a short notice, if at all. The punch with a boxing glove differs essentially form the punches with MMA gear. Technical comparisons would be tedious but basically boxers can and must to hit harder with their gear to achieve any effect while martial artists have to be careful about hand injury and usually hold something back with the smaller gloves. There is greater variety in MMA as any punch goes (except thumbing) while boxers have to use a closed fist and hit with the knuckles. This leads to a different technique and slight but critical variations of timing and range. McGregor will find himself in a whole new world even though he is considered a master of hand strikes. His motto of “timing over speed, precision over power” holds very true in boxing as well but the dimensions and tolerances are different here. Feet position an especially footwork are also of different nature. As with the stance, boxing footwork and feet placement would be suicidal in martial arts so McGregor will have to deal with this conflict as well. Last but not least McGregor does not have a boxing body. His line of work requires different qualities and his athleticism and agility are of little use in a boxing match. It would take him at least two years to achieve any kind of boxing fluidity, especially in the legs and shoulders and especially in the later rounds. He needs early rallies, after the fifth round it will be all up to Floyd. Age is a factor in boxing but skills, talent and experience matter even more that is why the odds are so heavily in Mayweather’s favor.